Do you love growing perennials but don’t like the weeds that need pulling? The next time you walk outside and see a garden bed full of weeds and reach for the Roundup, why not stop and ask yourself a question. “Why drench them with something that will remain in the soil for who knows how long?” Maybe you should reach for a common household product, instead. 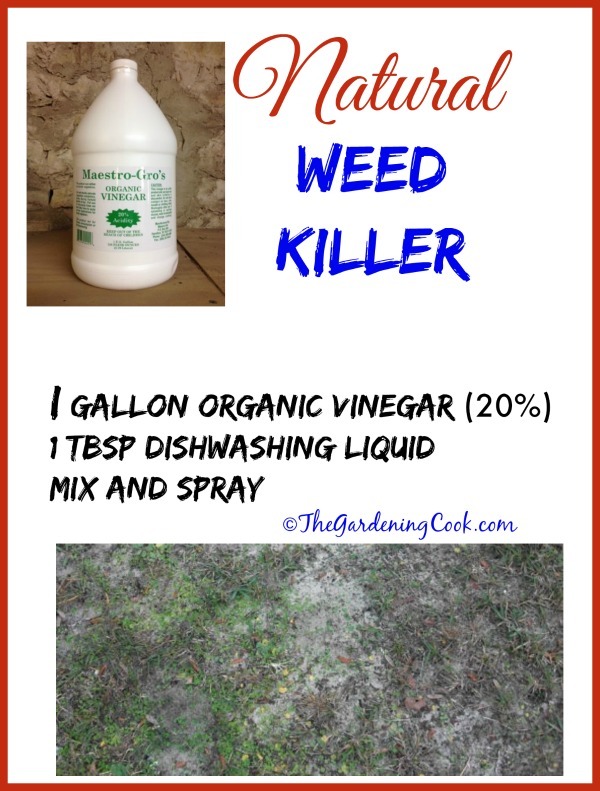 This natural vinegar weed killer is easy to use and so much better for the soil. Vinegar has many uses in the home and garden. It is an effective cleaner, a great way to keep ants off the counters and has dozens of other uses. Today we’ll put it to use as a homemade weed killer. 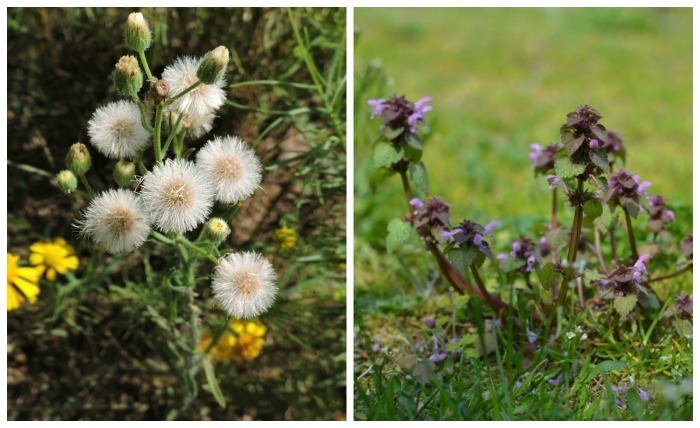 Weeds are the bane of any gardener’s life. Keeping on top of them accounts for a large part of the work that you need to do in the summer to keep gardens looking good. I sometimes combine weeds with rain water to make “weed compost tea.” You can find the recipe for this and also my homemade DIY Miracle Grow recipe here. I have seen dozens of methods for vinegar weed killer on the internet. The problem with most of them is that they suggest white vinegar and a LOT of salt. Salt is also very hard on the soil and surrounding plants. It can leach into the water table and is bad for the environment. It also takes a very long time to dissipate. 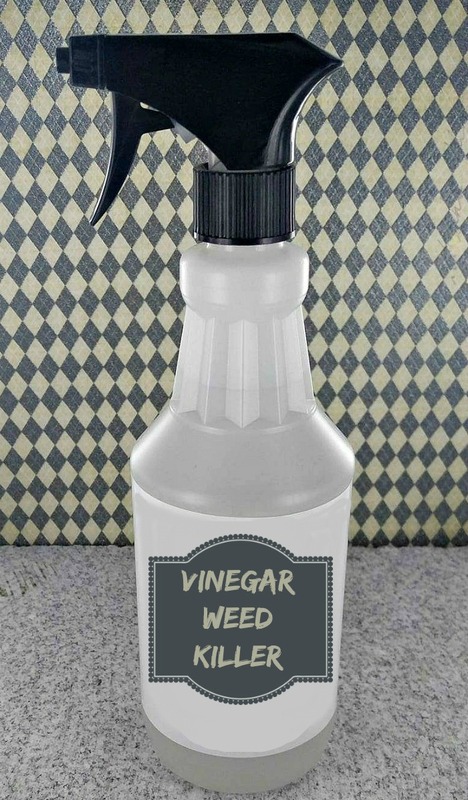 Also, plain household vinegar has too low an acidity level to really work well on weeds. 1 tbsp of dish washing soap. Mix well, and place in a container that you will use just for killing weeds. You can use a watering can, a spray bottle or a pump-sprayer to apply the organic vinegar. A pump-sprayer is the most efficient way to apply it. Be sure to rinse your sprayer after use, or metal parts may corrode in time. Use this weed killer in the sun. Be sure to apply the vinegar weed killer on a warm, sunny, and calm day. Try to apply it when there will be no rain for at least two days for best results. Be selective on your weeds! You need to aim directly on the weeds. Vinegar is not selective; it can potentially harm and nearby plants so care should be taken when applying it. You don’t want to get too zealous and end up killing your vegetable garden. Great for all types of weeds. This vinegar weed killer will work on all types of perennial, and annual weeds. You can use it on broad leaf and grassy weeds with great results. Use it on paths. This weed killer is great to use in the cracks on walkways, where grass and ornamental plants are not an issue. You can spray as much as you want here without worrying about nearby plants. Acidity levels. Horticultural vinegar is highly acidic – it will lower the pH of your soil for a few days or possibly weeks, so wait for a good rainstorm before you plant anything where you sprayed. The acetic acid in the vinegar does two things: it burns the weed’s foliage on contact and it temporarily lowers the pH of the soil, making it hard for the weed to make a comeback. Be careful on lawns. 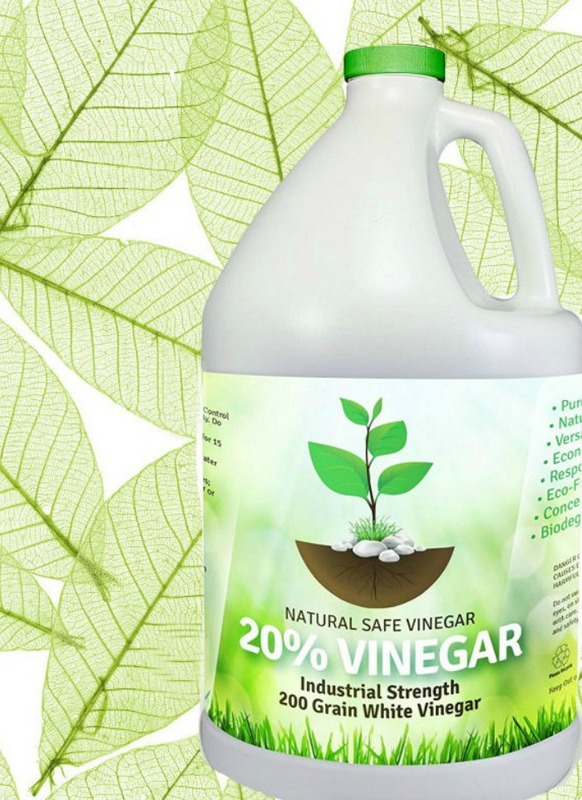 Since this vinegar weed killer is not selective, it will damage grass. If you have creeping Charlie in your lawn, try using this natural Borax weed killer to treat it. 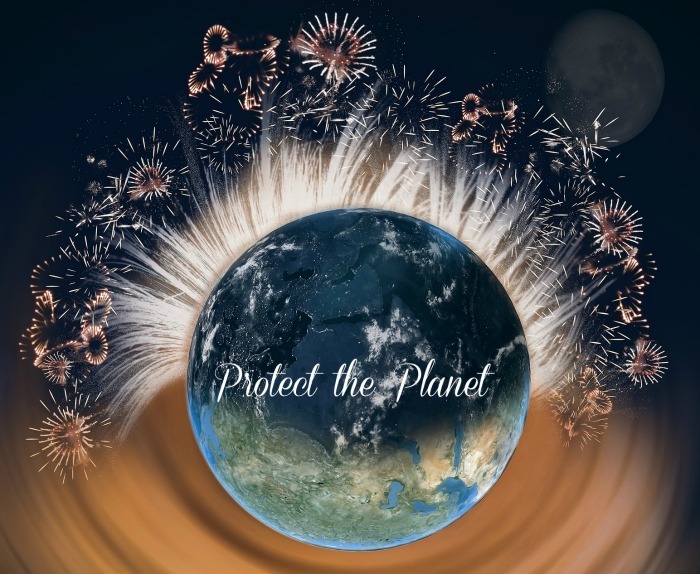 Good for the planet. The vinegar is completely biodegradable – it degrades in a matter of days – and does not accumulate so it is approved for organic agricultural use as well. Shop Wisely. Organic vinegar is much cheaper than Roundup, and doesn’t leave poisons behind. When you shop, you will notice that if the label says horticultural vinegar, there seem to be a bit price hike, but that is just marketing in my opinion. The trick is to get a 20% acidity level so any vinegar with this level will work, even if not labeled horticultural. Kill those weeds, save some money and help the environment. Note: Horticultural vinegar and organic vinegar are both available at garden supply stores (not the big box stores) and numerous places online. Search online for your best price. For more gardening tips, please visit my Facebook page. I heard about vinegar that it can help to kill weed. But how long for? Some weeds will stay dead. Others need reapplying if they are stubborn. Will this kill my grass? The instructions don’t say how much detergent to use. Suggestions? Also, no water? Just want to make sure we are doing it right! Thank you! Can it be used on floating plants IE Water Lilies? Thank you so much for sharing this! I will try the one yo mentioned “the vinegar must be at least 20% acidity which is why this remedy works better than normal vinegar which only has a 5% acidity level.” Same as you, I tried salt and vinegar, but it didn’t turn out the way I wanted to befor my garden. Thank you. How long does it take for this weed killer to take effect? Minutes, hours, days? Thanks. I used store white vinegar with dish detergent and it killed weeds and grass both. I intend to apply ground limestone and grass seed after soaking dead area. Will this work?……..Norman. I found a recipe that added orange, cinnamon and clove essential oils to the 20% vinegar. It started to killed poison ivy in a few hours! I have only found the vinegar online and it’s not cheap but to me it is totally worth it! Buy cleaning vinegar at Home Depot. its 20% and much cheaper than horticultural vinegar.